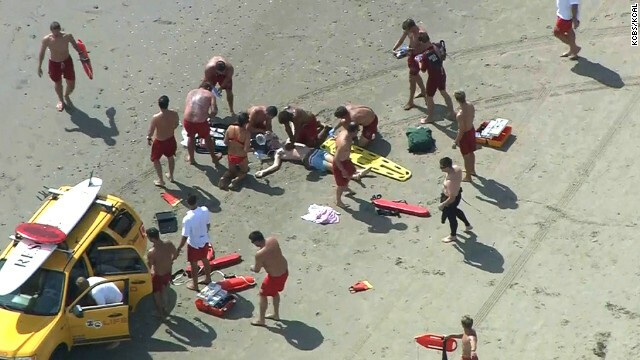 Emergency workers assist a lightning strike victim at California's Venice Beach. Lightning hits a famed California beach. A second American tests positive for Ebola. And the U.N. Security Council demands a humanitarian cease-fire in the Middle East. Thirteen affected: A sunny day at California's famed Venice Beach took a dark turn Sunday when one person died and a dozen others were injured after a rare lightning strike. A man found at the beach was declared dead at a hospital yesterday, but the exact cause of death is pending an autopsy, authorities said. MH17 crash site: Uncertainty hangs over an international effort to retrieve human remains from the crash site of Malaysia Airlines Flight 17 as fighting rages in eastern Ukraine. A team of Dutch and Australian officials was meant to visit the fields strewn with wreckage yesterday, but violence prevented them from getting near. More calls for a cease-fire: With more than 1,000 people killed in the Israel-Hamas conflict, the U.N. Security Council held an emergency meeting in New York early Monday and called for an "immediate and unconditional humanitarian cease-fire" in Gaza. New infections: A second American aid worker has tested positive for Ebola in Liberia, according to a Christian humanitarian group she works for. The news comes days after another group said American doctor Kent Brantly had been isolated after he became infected while treating Ebola patients in the same country. Slimmer border bill? House Republicans are fashioning a scaled-down immigration bill that would provide less than $1 billion and include a policy change that most Democrats strongly oppose. Calls for a solution are getting louder as lawmakers plan to leave town for their August recess. Scaredy cat? Is this cat terrified of being out in public or just lazy? You be the judge. Foxy play time: Two foxes play on a backyard slide. All together now .... awww! Best friends forever: Snuggle time between a baby and a puppy gives a whole new meaning to BFFs. Unlikely playmates: Rollie the armadillo plays with a squishy pink toy. I enjoyed the reporting style, captivating! So... A bill Republican governors on the border are SCREAMING for has been reduced and made unpassable by the Republicans in Congress. BRILLIANT! Guess there's only one thing left to say to that. Thanks, Obama. Baby Eisleigh and Clyde too precious and adorable together!!!!!!!! I wonder why the two foxes didn't use the ladder? Israel consistently distinguishes Hamas from the West Bank Palestinian Authority is the Chief Palestinian Negotiator ONCE AND FOR ALL debunking that or confirming that Hamas is totally sponsored by the Palestinian Authority?